There should be around 30 original Source Family members in LA during the week of the events. Different Family members will be appearing and speaking at each event, so each event will be unique. We will offer a Meditation at 5:00am SHARP on the 15th of November with all who are sincerely moved to sing the Sacred Name of God. Please call (808) 443-8868, (661) 313-3639 or (808) 936-3046 for more information. SKYLIGHT BOOKS -- Slideshow, reading, signing, and discussion of The Source Family and their activities during the "Mother House" days living in the Chandler Mansion in Los Feliz. 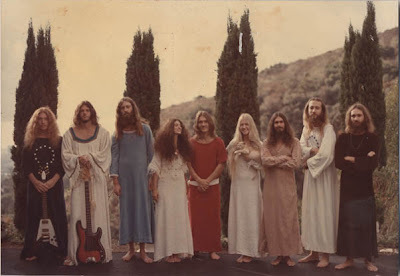 This is what some Family Members refer to as the "golden era" of the Source Family ~ With Isis, Electricity, and Om-Ne Aquarian, Magus, Electra and Orbit & others.